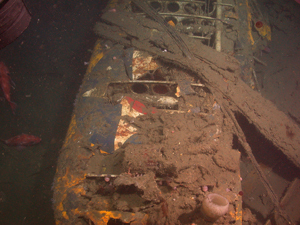 The Mystery of the Submerged Remains of the USS Macon . 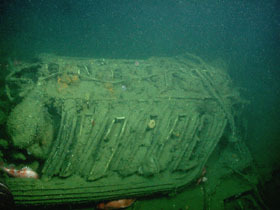 The exact location of the submerged remains of the USS Macon remained a mystery for nearly fifty years until a commercial fisherman snagged a piece of girder from the Macon in his net. The girder was displayed in a Moss Landing seafood restaurant on a plaque presented to the restaurant owners by the fisherman who had recovered the piece. Marie Wiley Ross noticed the girder structure. She had seen airship girders like this one as a child with her father, Lt. Comdr. Herbert V. Wiley, who commanded the Macon. Wiley, who was in command of the airship at the time of its loss, had also survived the loss of the USS Akron, the Macon’s sister-ship. Scientists were unaware of Marie’s discovery until 1989. 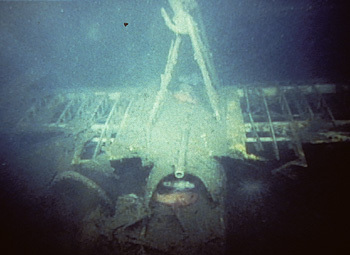 In June of 1990, Chris Grech from the Monterey Bay Aquarium Research Institute (MBARI) coordinated with the U.S. Navy’s three-man deep submergence vehicle (DSV) Sea Cliff, to locate and document the Macon’s remains. 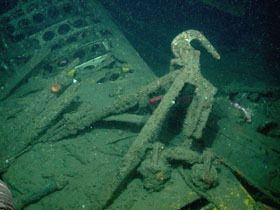 During the dives Sea Cliff recovered several artifacts from the site, and collected a definitive image of a Sparrowhawk arrester hook. Port wing of one of four Curtiss Sparrowhawk F9C-2 biplanes recorded at the USS Macon site. MBARI returned to the site in February and April of 1991 and videotaped the site using a remotely operated vehicle. The team located debris fields that included corroded girders, gasoline tanks, the nose-mounted mooring assembly, and the dirigible’s German-made Maybach engines. The control car was also located. Although it was flattened, MBARI was able to record windows, chairs, chart tables, and a lead pencil. Four of the Curtis F9C-2 Sparrowhawk biplanes were also located revealing their aluminum frames along with some deteriorated wing fabric still intact. The 1990/91 surveys recorded the bow and mid-section debris fields. During these survey missions MBARI worked with the Navy to collect and distribute artifacts including the arrester hook from a Sparrowhawk. This artifact was conserved at East Carolina University. Sky-hook located at the center of the Curtiss Sparrowhawk F9C-2 biplane. The pilot during flight would position the aircraft below the USS Macon's hanger where a trapeze was lowered and the pilot would position the hook onto the trapeze. Sparrowhawk pilots were nicknamed the "men on the flying trapeze." One of eight German built Maybach 12 cylinder gasoline engines that served as the propulsion system for the airship. During the 2006 expedition five Maybach engines were located and recorded.